On this day in 1945 Benito Mussolini was executed. The doomed dictator was captured by Communist partisans the day before as he attempted to flee to neutral Switzerland. On the afternoon of April 28 he and his remaining associates were lined up against a wall and shot by machine-gun fire. In a humiliating end to two decades of fascism, their dead bodies were hanged from the gantry of a Milan petrol station. While the crowds gathered that day rejoiced in Mussolini’s execution, famously spitting on his body, a considerable minority of Italians did not rally to the new democratic politics. Two years previously the country was split between the pro-Allied government in the South and Mussolini’s Italian Social Republic (RSI; often called Salò) in German-occupied regions. The ensuing war set not just Axis against Allies, but Italians against Italians. Even after the Fascist collapse in 1945, diehard elements defended the lost cause. Beyond the murky world of underground paramilitary groups, they also formed a new party, the Italian Social Movement (MSI). Named after the RSI, this party was by the 1970s Italy’s fourth largest electoral force, scoring close to 10 percent of the national vote. It was not just a far-right party, but one that explicitly claimed Mussolini’s legacy. While antifascists champion the centrality of Resistance values to today’s Italian democracy, the neofascists faced a very different task in defending their ancestors’ record. After 1945, the MSI and smaller groups first of all worked to counter claims that the RSI had been a mere Nazi puppet, insisting on the patriotic legitimacy of its cause, and pointing to what it might have achieved if it had not been defeated in the war. Commentators often portray Italy’s sizeable neofascist milieu as proof that the country never got over World War II. We might better say that a resilient postwar subculture has been able to penetrate the mainstream. At a time when Italian democratic politics looks weaker than ever, its parties have given ground to the moral relativism long promoted in the memory of the defeated. The Italian Republic created in 1946 claimed to unite Italians across political divides, reflecting the spirit of the Resistance alliance of Communists, Christian Democrats, Socialists and others. However, the 1952 Scelba Law explicitly banned “the reorganization in any form of the dissolved Fascist Party.” The Fascism that the Resistance had fought to overthrow was not part of the ‘constitutional arc’ of democratic politics. 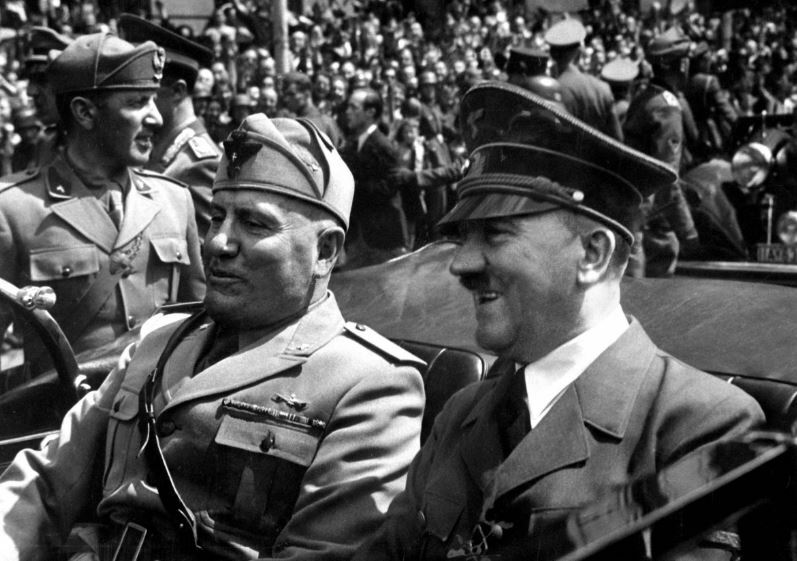 The Resistance parties at the center of the new political order had long denied the “Italianness” of the Mussolini regime, referring to his supporters as the nazifascisti’. This label totally identified them with the German occupier, and thus presented them as mere traitors who had sold out Italy to the Duce’s alliance with Hitler. The Resistance was not, then, one side in a civil war, but the representation of Italy itself. The old Fascist Party may not have been welcome in the new democracy, but many of its officials were. Even beyond the ex-Fascists who switched sides during the Resistance, the new democracy inherited tens of thousands of civil servants and officials from the Fascist period. A brief period of purges was followed by a general amnesty (under Justice Minister and Communist leader Palmiro Togliatti) designed to restore social peace. As the Cold War dividing lines hardened and the Communists were pushed out of the national-unity government in 1947, the political tide began to turn. The anticommunism that had been pacified, or at least quietened, during the Resistance now began to raise its head more aggressively. Smarting from defeat in the war, the former supporters of the RSI began to organize in a new form. The MSI formed in 1946 was led by prominent RSI officials. Its founder and longtime leader (1947–1950, 1969–1987) was Giorgio Almirante, who had been a general and Popular Culture Ministry official in the RSI. Other key leaders included RSI war minister Rodolfo Graziani. Yet this was a highly contradictory party, over time integrating “social” fascists as well as traditional right-wing and even monarchist forces. The RSI’s ambiguities allowed it to serve as a common source of inspiration. It had emerged as a result of splits in the ruling class, as Italy buckled under the weight of the war. On July 25, 1943, after a vote in the Fascist Grand Council, the King had Mussolini arrested and installed a new regime that sought peace with the Allies. This in turn prompted a German invasion, liberating the Duce and restoring him to power. Established in German-occupied regions, the RSI essentially relied on Hitler’s backing. Yet the state founded in September 1943 also presented itself as a radicalization of Fascism, now that the Duce was less bound by traditional royalist, church, and business elites. Talk of socializing industry, under the direction of former Communist Nicola Bombacci epitomized this attempt to project a revolutionary image. For the MSI created in 1946, the RSI was not a mere Nazi imposition but the fulfilment of Italian Fascism, sadly cut short by military defeat. While the RSI’s rapid collapse made it difficult to point to any real record of achievement, neofascists could at least try to emphasize its patriotic dimension, claiming that antifascists had fought not for “national liberation” but simply to crush their Italian political opponents. As historian Francesco Germinario argues, this effort to “nationalize” the RSI also meant connecting it with less strictly political values of courage, sacrifice, and honor. If the bulk of partisans were draft resisters who refused to fight in the RSI army, and were thus forced to take to the mountains, those who did serve could be revered for their duty to the Patria, fighting the Allied invasion even when it seemed a lost cause. The neofascist milieu was thus from the outset marked by, on the one hand, an attempt to emphasize the full political significance of the RSI, in its bid to achieve what Mussolini had long been blocked from doing, and, on the other, a depoliticized view of its fighters’ record as driven by disinterested patriotism. These contradictory claims were united in their rejection of the antifascist parties’ claim of a monopoly on the moral high ground. The question of antisemitism particularly undermined this presentation of a devotedly patriotic Fascism. If even a conservative historian well-regarded in neofascist circles like Renzo de Felice presented the 1938 laws banning Jews from public employment as the Duce’s concession to Hitler, neofascists struggled to reconcile this with an image of Fascism’s true Italianness. The dominant explanation was in fact a recycling of antisemitic themes. The Jews were arrested and expropriated not because of Nazi-style racism but because they were foreigners and, as the Fascists’ 1943 Verona Manifesto put it, “enemies in times of war.” Of course, the Italian Jews’ supposed enemy allegiance was a creation of Fascism, precisely because it excluded them from the national community. Cohen could not bear to do nothing for the Republic [the RSI], or indeed to be its enemy, and with the help of a false ID card secured with the help of an acquaintance, under the pretext of fleeing the Germans, he turned up at an army-enlistment office, and slipped through amidst the confusion, thus becoming the Alpino soldier Antonio B., who when he heard it said that the Jews were enemies of the [RSI], he wanted to say no, that was not true of all Jews, for instance . . . then he shut up, fearing how they would have treated him as a Jew. Among the most renowned works of the “literature of the defeated,” De Boccard’s novel typified the attempt to present the RSI’s antisemitism as an unfortunate and unnecessary element of its politics, imposed by the German ally. Nonetheless, this fictitious character was less a “type” than merely a means of plugging a gaping hole in neofascist memorialization, displacing responsibility for antisemitism away from Italians. While De Boccard’s work was written for a subculture seeking exculpatory myths, such narratives could also take advantage of a wider Italian tendency to take responsibility for the Holocaust. Projected onto Germans alone, the Holocaust could be portrayed as external to Italian national history. Indeed, in the early postwar decades, specifically Jewish suffering was marginal to institutional memorialization of the German occupation. De Boccard’s example of the patriotic, Mussolini-loyalist Jew was imaginary. It sought to depoliticize the RSI and pretend that it could be a rallying point for all Italians, much as antifascist parties claimed the postwar democracy was. Yet in the post–1945 neofascist movement the depoliticization of the RSI was also married with veneration of the policies it promised to implement but was unable to achieve. Indeed, if the RSI’s explicit antisemitism was minimized or explained through contorted justifications, other aspects of the 1943–45 regime’s rhetoric were taken at face value and glorified. This was particularly true of its supposed social vision, in postwar decades a continuing source of inspiration for “Third Position” type politics which claim that fascism is a viable alternative to both Marxist socialism and capitalism. De Felice distinguishes between the Fascist movement (its ideology, its social project, and mass base) and the historical Fascist regime (i.e. one that from 1922 to 1943 worked through institutions inherited from liberal Italy, albeit also recasting them). In this logic, the RSI’s sympathizers would portray the 1943–45 period as a fuller expression of the movement; a more totalitarian overhaul of the bases of Italian society. The syndicalist and Sorelian currents of the interwar Fascist establishment, or indeed the ‘social’ thought expressed in journals like l’Ordine Corporativo, Il Lavoro or Primato, did not simply feed the creation of the RSI. Individual trajectories were more complex than that: some of these elements joined the Resistance whereas others became doggedly pro-Nazi. But the RSI doubtless gave new life to the idea of Fascism as a social revolution. The manifesto drawn up at the Congress of Verona in November 1943 lay down ideological markers that persisted into the postwar neofascist milieu. Most notable was its proclamation of a “syndical socialism” and “socialization,” a sweeping program to create collective economic ownership. The regime’s quite opposite record over the previous decades was blamed on opposition from the monarchy and the old state machine. In reality, in the RSI’s nineteen-month existence the Fascists did not even begin to implement these measures. The works commissions created in factories were wholly Fascist-run, and antifascists strongly opposed any worker participation within them. If the regime-controlled press criticized even the Communists for their lack of social ambition, this belated demagogy was unable to refound Fascism on a new basis. The Fascists’ failure to carry through these measures did not stop the myths of fascist socialism persisting into the postwar period. For elements of the MSI this was the unrealized promise of the RSI, unfulfilled only because of German pressure or lack of time. If the RSI was meant to be the true fulfilment of Fascism finally unbound from the Church and monarchy, its lack of achievement was in turn blamed on outside factors. Such a social vision was rarely the dominant current in postwar neofascism. Nonetheless the MSI’s place within the Italian political panorama would repeatedly shift the balance of power between its internal factions. This began even in the late 1940s, as the anti-Americanism inherited from World War II began to give way to the prospect of an anticommunist alliance, in which the MSI could seek legitimacy. If after 1945 Italy was ruled by a broad cross-party alliance, by 1947 this front had begun to disintegrate. Prime Minister Alcide de Gasperi’s visit to the United States and Harry Truman’s call for an American intervention in European affairs forced Italy out of any merely neutral position. With the prospect of Italy joining NATO in the balance, the MSI was split between more and less doggedly anti-American currents. The fluid nature of the MSI and its multiple internal factions allowed it to be buffeted by other forces. Notable in this regard was the experience of Il Pensiero Nazionale, in which the Communists attempted to sponsor a left-Fascist and anti-NATO group, dividing the MSI internally and bolstering opposition to the Western Bloc. But the prospect of an anticommunist pact pushed the MSI toward an embrace of NATO. Indeed, over the 1950s, the general course of MSI policy was to seek a rapprochement with the conservative right. It sought to respond to elements within Christian Democracy willing to bring the MSI in from the cold and end the antifascist cordon sanitaire. While in its early years the party had been led by RSI veterans, in 1954 the “philo-bourgeois” current under Arturo Michelini took the leadership. This initiative reached its height over 1960, when a parliamentary vote proved that Christian Democratic premier Fernando Tambroni’s government rested on the MSI’s backing. This shock to antifascism, combined with the MSI’s provocative bid to hold its congress in Genoa (a city known for its Resistance record) provoked days of rioting and sharp police clashes with demonstrators around Italy. While these events highlighted a continuing fascist menace, the sharp pitch of the social conflict in fact sank the attempt to normalize the MSI. The antifascist mobilization now more than any point since 1945 succeeded in delimiting a space of democratic politics in which the neofascists were unwelcome. Tambroni quickly resigned and the Christian Democrats soon turned to their first ever pact with the Socialists. In this sense, Italy’s New Left began not in 1968 but in 1960 with the defense of what had not been won for certain in the Resistance. Yet the failure of the MSI’s conservative turn, and the strengthening of a militant left, also radicalized the neofascist base and fed the rise of paramilitary organizations active over subsequent decades. First forming in 1960, Stefano delle Chiaie’s Avanguardia Nazionale was a leading force in this new galaxy. The Avanguardia Nazionale rejected the MSI’s parliamentarism and openly assaulted left-wing militants and meetings. Linked to “black prince” Junio Valerio Borghese (a leading officer in the RSI’s navy), in 1970 it joined Borghese’s abortive attempt at a military coup. It like a panoply of fascist cells (Ordine Nero, Ordine Nuovo, NAR) murdered not only left-wingers but even judges and random members of the public. Fascist violence slowed over the 1980s, though attacks continue into the present. Even in the run-up to March’s general election, an armed assault on a group of African immigrants in Macerata highlighted the persistence of a violent fascist subculture. This is not, however, a simple recreation of the terrorismo nero of the late 1970s, a well-organized paramilitary apparatus whose atrocities killed hundreds of people. Amid this wider decline in social conflict, the MSI renewed its project of entering the mainstream. Long excluded from government, by the beginning of the 1990s it could exploit the collapse of the historic antifascist parties. The fall of the Eastern Bloc led to the dissolution of the Communist Party in 1991, and this in turn helped bring down its Socialist and Christian Democratic rivals, struck by massive bribery scandals. For five decades the memory of the RSI had bound the MSI to a specifically fascist identity. But the collapse of the Christian Democrats in 1992–94 portended a general political realignment. As billionaire tycoon Silvio Berlusconi welcomed it into his new right-wing alliance, the MSI reinvented itself as the Alleanza Nazionale, and slowly began to assume more varied ideological reference points. This was no abrupt or uniform change. An MSI leader like Gianfranco Fini had in 1987 spoken of the “fascism of the 2000s,” but over the following decades gradually redefined himself as a liberal-conservative critical of Berlusconi. Others like Gianni Alemanno, former MSI youth leader, reinvented himself as a Berlusconi ally while also maintaining links to neofascist subcultures. Smaller circles stuck to the old slogans. Gianni Alemanno’s victory in the run-off of the Roman mayoral contest highlighted the contradictions of this de-fascistization. Celebrating this ex-Fascist’s victory on the night of April 28, 2008, supporters outside city hall chanted “Duce! Duce!” and raised their arms in Roman salutes to honor their long-time camerata. Alemanno had recast his politics, but some of his followers had not got the message. With these words, Rome’s mayor expressed sentiments widespread since the collapse of the old Resistance parties. Polemicists posing as historians such as Giampaolo Pansa have succeeded in pushing a narrative that reduces the war to an exchange of ‘crimes’ by morally equivalent camps. This is the cutting edge of the recent revisionist wave: the attempt to dismiss the political hopes of that period as mere cover for sectarian score-settling. It is easy to portray militant fascist subcultures like CasaPound, a Third-Positionist Roman social center known for its spectacular publicity and thuggish antics, as at the center of a rising wave of fascism in Italy. Such violent groups have indeed been tolerated by mainstream politicians, including Alemanno, who as Roman mayor allowed CasaPound to establish a foothold by occupying a large, well-located building. Yet such “hipster fascists,” who remain a marginal subculture, are hardly alone able to drive the current revisionism. The anticommunism at its heart is above all driven by former left-wingers, who constantly cede political ground in their postmodern commitment to abandon the “ideologies of the twentieth century.” They venerate the “patriotism” of the Resistance yet portray its politics as sectarian and divisive. This does not amount to a rise in Fascism, and nor is the rise of insurgent parties, including the hard-right Lega, a recrudescence of Mussolinian politics. What we are instead seeing today is a more general weakening of republican values. The postwar Republic declared itself antifascist and indeed “founded on labor.” Today not only are these sentiments unfulfilled, but they are deemed merely irrelevant. Pronouncements of the state’s founding virtues offer little comfort to young Italians unable to find a place in the world. Only a small minority of them actually join the direct opposite camp in groups like CasaPound. For far more, Resistance values seem like a dead piece of history. The social ambition and moral charge of those times is far-removed from the contemporary political wasteland.